The US equity market and the equity markets of countries around the world corrected on the eve of peak earnings season. The major global indices fell more than 7% in most cases, driven lower by fear of rising interest rates and declining earnings growth, but the moves are counter to trend and not supported by the outlook. Not only is the current earnings cycle expected to produce high levels of corporate earnings growth so is the next. The caveat is that earnings growth will begin to taper off in the quarter but even that is not something to be afraid of. Earnings growth will be present, earning will remain strong and US corporations will be able to maintain or increase their dividends and continue buying back stocks. With those two fundamental factors in play any dips in the market are buy-on-the-dip opportunities investors and traders can take advantage of. The good news is that the US indices are already bouncing back from their lows. Earnings from JP Morgan, Citigroup, and Wells Fargo all beat expectations and helped the broad market bounce back more than 1.5% from its low. The move in prices helped the S&P 500 regain the upper side of an important uptrend line and support level that will help pressure prices higher as the earnings season wears on. 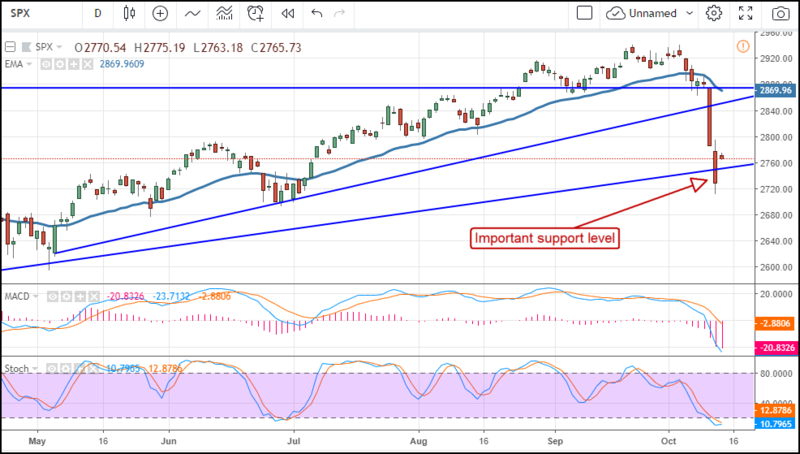 The indicators are showing bearish extremes that suggest a retest of support is probable, possibly as low as the 2,720 level, before the correction is over. Next week the earnings calendar is jam packed. Look for more reports from big banks as well as from consumer products, industrials, tech and transportation. If the bounce is going to fail it will probably happen soon. There will be enough reports next week to give the market a broad glimpse of what to expect the rest of the cycle. A move up from this level, or from confirmed support in the 2,720 to 2,760 range, is bullish and trend-following. Traders with longer-term outlook and some tolerance for risk can enter positions at any time below 2,760, traders with shorter-term outlook should wait for tests of generally accepted support targets.